I don't know about you, but one of the things that makes both me and Dave particularly happy in life is photos of the kids. Our 1910 colonial is decorated in Early Max and Early Sabrina—there are baby pics of them everywhere. I'd seriously consider moving so we could find more room for photos. You can bet I said yes when Uncommon asked if I'd like to try one of their customized cases for the iPhone/iPod. 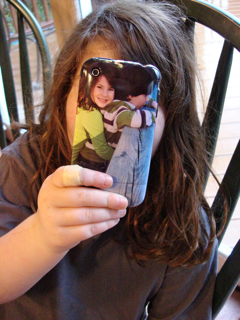 You just upload a photo, click "order" and a few weeks later, a case arrives with an embedded pic. It's kind of magical—the thing doesn't peel or chip, no matter how much your kids like to play catch with your device and/or randomly fling it around. I've gotten tons of compliments on mine. You can also choose from dozens of cool designs if you'd prefer. The Uncommon peeps are giving away two cases, each worth $40 (free shipping included). To enter, just leave a comment about who usually takes the photos in your family. My answer: ME! Which is why I'm in hardly any family photos. This giveaway is open until Thursday, June 9 at 11:59 p.m. ET and is for U.S. and Canadian residents 18 and older. I will randomly pick one winner, alert you by email and announce it here. Good luck! Update: The winners are Finding Normal and Justin and Victoria Nelson. Enjoy! I'm always the one taking pictures in my family too! I take ALL the photos!! Ooo, finally a giveaway I want to enter! My husband loves his iPhone and I love taking pictures of my beautiful boys... usually with my iPhone! I also liked you on Facebook... I'd been saving that for something good! ;) Too bad I'm already a Twitter follower. well seeing as how I am a professional photographer...that would be a big ME!!!! My sister, with her amazing camera. My husband--with me ducking and weaving to try to stay out of the pix! Hand's down, I take 99 percent of the photos... which is why I'm in one percent of the photo albums! I take most of the photos of my kids... with my iPhone! Every few months my husband takes photos of the kids with his fancy DSLR but usually it's because I threaten to take the kids to Picture People and get what he thinks are corny portraits of the kids. I am the photo taker and am rarely in photos. I have been making more of an effort to get out from behind the camera. I have a new iphone and I love that I can turn the camera on myself and take self portraits with the kids. I am usuaully the photo taker in the family too. for sure me!! I am a picture taking fool! Like you Ellen, I take the pictures! That way I'm not in them, and since I do all the uploading, I edit, delete, etc. when necessary! I have been playing with this all morning! Some people have no food...so I know our techie shortcomings are not needs. reminder: I follow you everywhere, Princess Ellen. I read you every single Day, even tho I usually don't have time to comment. I take most of the pictures in our family. ps eek! I meant to say...We do have a Tracfone, (pay as you go)which we share. It just doesn't take photos. It sounds like I'm begging, but I'm really not. I really really mean it. I take all the photos too. Sometimes I see a reflection of myself and my daughter and am actually startled by how little she looks like me! My significant other does...she usually has the camera ready before I can even ask her to pull it out! It's always me! I don't take good pictures! Lol! I followed u on twitter too! My husband and our eldest daughter take the pictures in our family. Me! I take all the photos, but I do like being behind the camera instead of in front of it. Just wish I had more of me and my son together! *I* am our photographer. This is evidenced by not only my lack of appearance in 99.9% of our family photos, but by the fact that the majority of the .1% I *am* in are all taken, curiously enough, at exactly one arm's length away from my head. WOOHOO! It's working! I also follow you on Twitter. Me me me! It's all about me---taking pictures of you!! I'm the one who is always taking pictures in my family! Following @LoveThatMax on Twitter @hle123. I take the pictures in my family. It seems to be a mom thing. My boyfriend does. I don't even bother trying anymore, since his always turn out so much better! I take all the pictures in our family but my older sons are trying to start. either my bf or i usually take the pics! I usually take all the pictures! I'm the photographer in the family!